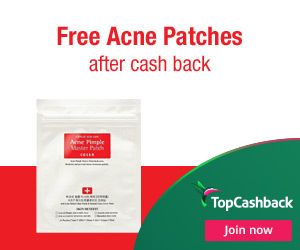 These Acne Pimple Master Patches heal blemishes and helps to stop future breakouts. They prevent secondary infections and absorbs exuded substances for faster wound repair. These COSRX skin care products are safe to use even for people with sensitive skin. Each patch is clear and acts as a hypoallergenic dressing. They're easy to put on and will stay in place as needed. These skin care products also act as a barrier to prevent bacteria and dirt from clogging pores. They come in a resealable pack with three different patch sizes, making it easier for spot treatment. 3. Add one (1) Cosrx Acne Pimple Master Patch (24 ct) priced for $5.00 to your cart and shop as you would normally then checkout. If the price changes or anything happens to the stock, the deal is officially over. 5. In about 14 days $10.99 cashback will post in your TopCashback account.